As with campus programs, an online psychology degree program focuses on human behavior at the cognitive, social, and emotional level. In a strong undergraduate program, you will gain foundational knowledge of the field and develop invaluable communication, research, and analytical skills that can be applied to countless industries. Those who earn a psychology degree online often pursue careers in human resources, marketing, sales, and public relations. Others attend graduate school to study psychology, social work, counseling, or law. Even though the variety of careers and educational opportunities that stem from a bachelor's degree in psychology make for a valuable investment, affordability is still an important consideration to make when choosing a program. A number of programs offer affordable online psychology degrees with discounted tuition rates and flexible timelines that allow you to work while earning your degree. To help with your decision, we've ranked a number of accredited online psychology programs for affordability. We do distinguish between the cheapest online psychology programs, in terms of tuition, and the most affordable programs in terms of overall return on investment. 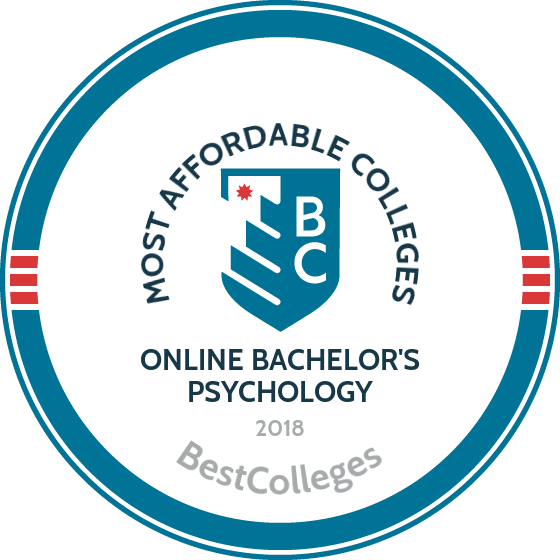 Taking into account a number of affordability factors, including tuition and loan default rates, we have ranked the 25 most affordable online bachelor's in psychology degrees. These online options are offered by institutions that have a track record for helping students graduate on time, providing financial aid, and launching graduates into successful careers. UF Online offers more than 500 courses, 19 majors, and five minors. The bachelor of arts in psychology is a 120-credit program that requires courses in four core areas. There are also elective requirements. The degree prepares students for careers in education, business, personnel management, counseling, and a variety of graduate programs. The majority of online courses at UF are asynchronous, and students determine their course load with the support of an academic advisor. Online students can network and connect with classmates and faculty through the virtual student plaza. The online psychology degree offers significant cost savings to in-state and out-of-state students compared to other residential programs. Students can enter online programs in the fall, spring, or summer. Transfer applicants should have a minimum 2.75 GPA and have completed certain courses in the areas of science, psychology, and pre-calculus. Required transfer courses must have been passed with a minimum C grade. Utah State University offers a BA and BS in Psychology at over 25 regional campuses and entirely online. If a student completes all major courses then they will receive the BS; the BA requires additional proficiency in a foreign language. The 120-credit degree includes 28 credits of required psychology courses and six credits in psychology specialization classes. Students must also take one course from each of the four domains: biological basis of behavior, learning and cognition, sociocultural influences, and persons and society. Online student resources include tutoring, academic advising, career services, and IT assistance. Transfer students and students from other majors qualify for pre-psychology with a minimum 2.75 overall GPA. To become a psychology major, students must complete certain prerequisite psychology online courses with a 3.0 GPA and then submit a written application to the psychology department. Students who live out-of-state are charged a special tuition-only rate. Students interested in pursuing careers as career counselors, educators, mental health care providers, or researchers may be interested in earning UCF’s bachelor of science in psychology. Students in the 120-credit program choose one of the following tracks: clinical psychology, experimental, general, human factors psychology, industrial/organizational psychology, or neuroscience. Psychology students also complete a two-credit capstone course. This affordable psychology degree online charges the same tuition to residents and nonresidents. Applicants should have a minimum 2.0 GPA from the last school attended. To complete the degree online, students must have satisfied the general education and college-level foreign language requirements. Distance learners should also have previously completed three science classes and statistics. Students residing in Alabama, Arkansas, Delaware, Maryland, Michigan, Minnesota, and Oregon are not eligible to enroll in any UCF online courses. Graduates understand basic psychology terminology. The school encourages students to participate in extracurricular activities, like internships and fieldwork. Excelsior College, located in Albany, New York, is a leader in distance learning. The school focuses on creating courses that fit the budgets and schedules of working adults. The bachelor of arts in psychology degree is 120 credits, which includes 90 credits in the arts and sciences. At least 33 of the total credits must be in the major, this includes a three-credit capstone course. Other core requirements of the degree include general psychology, statistics, research methods, history of psychology, and research and writing courses. Excelsior offers asynchronous online courses. They also assist students in finding loans, grants, scholarships, and additional sources of funding. The school provides payment plans that divide tuition into monthly installments. The college maximizes transfer credit, providing applicants with a preliminary review to determine how many credits will apply towards the degree, and Excelsior also allows credit by examination for many courses. Charter Oak State College, a public online college with 15,000 alumni, offers master’s, bachelor’s, and associate programs. The bachelor of science in psychology is a 120-credit program that requires a minimum of 39 major credits in core, elective, and concentration courses. Students must complete a three-credit capstone course. Psychology majors also fulfill 15 credits in their concentration of choice: life span, social/behavioral, cognition and learning, or general psychology. All students are required to take the cornerstone seminar, which focuses on critical thinking, research writing, and digital communication. Courses include cognitive psychology and abnormals psychology. The college has generous transfer policies, allowing students to transfer in up to 87 credits. After students submit transcripts and any applicable test scores, Charter Oak will provide a preliminary credit evaluation within 10-14 days. This affordable psychology degree online offers scholarships and payment plans. At Florida International University, every online undergraduate student is paired with a student success coach. FIU has over 2,400 undergraduate psychology majors. The fully-online bachelor of arts in psychology focuses on current trends in the field, with courses in the science of psychology and theory and practice. The online psychology degree requires students to earn at least 120 credits. The psychology major requires 36 credits, with courses in research, electives, and area requirements. In area requirements, students choose one course from each of the five different areas: cognitive and neuroscience, social, applied, clinical/personality, and developmental. Students at FIU are admitted directly into their chosen major and can start the program in the fall, spring, or summer. Applicants with over 60 transferable credits are not required to submit ACT or SAT scores. Students must earn a C or better in all major courses. Azusa Pacific University, located in San Dimas, California, offers a bachelor of arts in applied psychology that gives students the opportunity to customize their experience by choosing a 15-credit emphasis. With over 25 emphasis options available, students can specialize in a subject that fits their career goals. Recommended emphases that may accompany the online psychology degree include applied pastoral counseling, clinical psychology, and educational psychology. Graduates are prepared to work in social services, the justice department, and nonprofits. The 120-credit degree requires 60 credits in general studies and 60 credits in the major/emphasis. Tuition is the same for all students regardless of residency. To be considered for admission, freshman applicants should have a minimum GPA of 3.00 and submit ACT or SAT scores; transfer applicants should have a minimum GPA of 2.20. Online students at CSU are charged the same per-credit tuition, regardless of residency. Students interested in the bachelor of science in psychology can apply for fall, spring, or summer enrollment. Applicants should have a minimum 2.00 GPA and have satisfied CSU’s admission requirement in math. Distance learners must earn at least 120 credits to graduate. Transfer students must complete at least 30 upper-division credits through CSU. Students must take three lecture-lab courses, which pair a three-credit lecture with a two-credit lab, and have six to choose between. Lab-lectures are offered in psychological topics such as social, organizational, industrial, and cognitive psychology and sensation and perception and measurement and testing. Lecture-labs allow students to customize their program and better understand how science impacts human behavior. The average class size is 21 students. Learners interact with their peers and faculty through discussion forums and video conferencing. Students interested in an affordable psychology degree online can choose between a BA or BS in psychology from UHV. Both degrees require 120 credits, which includes nine credits in the psychology general requirements and 27 credits in the psychology major. The curriculum also includes 33 credits of electives, which can be used to add a minor. Online courses are offered through the Blackboard platform. To be admitted as a freshman, a student must meet two out of three of the following requirements: be ranked in the top 50% of their class, have a minimum 2.0 GPA, and/or have scored a minimum of 940 on the SAT or 18 on the ACT. Transfer students must have earned at least 12 credits and have a minimum GPA of 2.0. Students who want to continue their studies can apply to one of UHV’s master of arts programs in counseling psychology, forensic psychology, or school psychology. Nebraska’s Bellevue University offers a BS and BA in psychology. The psychology online degrees are accredited by the Higher Learning Commission. Both degrees require students to earn 127 credits, which includes 27 general education credits, 51 elective credits, 40 major credits, and nine Kirkpatrick Signature Series credits. The Signature Series is a requirement of all Bellevue students that includes courses in american vision and values, tradition and change, and freedom and responsibility. The BS degree requires College Algebra and a lab science course, while the BA degree requires either a culture course or Spanish and nutrition or human genetics. All students pay the same per-credit tuition, regardless of residency, and the university offers generous transfer policies. Online students take small classes that are taught by faculty with real-world experience. Support for online learners includes tech support, writing and tutoring support, and continuous access to library resources. The university offers open enrollment, and students can choose from several start dates throughout the year. The Chicago School offers a BA in psychology that focuses on research skills, decision making, communication, and critical thinking. The program prepares graduates for a variety of professional careers or graduate education. The curriculum is delivered through the Canvas platform, and the online psychology degree is offered in a full-time or part-time format. Full-time students can complete the degree in four years. Classes include abnormal psychology, neuropsychology, and research methods, which focuses on ethical psychological research issues. Applications are accepted on a rolling basis, with online programs starting every eight weeks. Tuition for online programs is the same as on campus. The school offers scholarships that range from $1,000-$10,000 for the academic year. Scholarships are based on merit or need, and financial aid is available as well. TUW offers a number of online associate, bachelor’s, master’s, and doctoral programs, including the bachelor of arts in psychology. The 120-credit program includes 45 credits in general education, 39 credits of core requirements, 24 credits of electives, and 9-12 credits in a concentration. Concentration options include industrial/organizational psychology; elementary, secondary, or special education; or human services. Students who enroll full-time can complete the program in three and a half years, and part-time students can complete it in seven years. Online class sizes are limited to ensure students receive individual attention from faculty. Courses last eight weeks. All course materials are online, so students save money by not having to buy textbooks. TUW offers the Achieve More Scholarship, which extends scholarship opportunities to students who maintain continuous enrollment in this affordable psychology degree online. Online bachelor of science in psychology courses at WSU are taught by faculty who have expertise in areas of experimental and clinical psychology. The major requires 35 credits in psychology coursework, and students can choose a concentration in neuroscience/cognition, social/motivational, or clinical/counseling. With psychology online degrees accredited by the Northwest Commission on Colleges and Universities and the American Psychological Association, graduates are prepared to work in areas such as health and human services, business, and research and development. Graduates are also prepared for advanced education. Washington state residents pay slightly lower tuition than non-residents, but all online students are eligible for financial aid and scholarships. Freshmen applicants are required to submit transcripts and either SAT or ACT scores. Transfer applicants with an accepted associate degree only need to submit college transcripts. WSU students are also required to complete a writing portfolio after earning 60 credits. The portfolio requires three samples of graded writing from three different courses and a two-part, timed essay. Brandman University has over twenty locations in California and Washington and offers dozens of online degrees and certificates, including a bachelor of arts in psychology. Online students receive access to student support services and financial aid. Courses are asynchronous and delivered through the Blackboard platform. Students applying for the program should have 12 or more transferable credits. This online psychology degree is affordable. The psychology degree requires 48 credits, including 33 in core studies and 15 in a concentration. Students can concentrate in preclinical, industrial/organizational, child psychology, community psychology, or general psychology, which addresses a broad range of topics. Courses include physiological psychology, critical thinking, and abnormal psychology. Classes are taught by faculty with field experience. Students are taught to apply theories to real-world applications. A capstone project is required. At Bryan College, located in Dayton, Tennessee, all courses are taught from a Christian worldview. The bachelor of science in applied psychology is applicable to adult students continuing their studies and to first-time freshmen. The program prepares graduates to work in human services and early childhood development, or to pursue an advanced degree. The degree requires 124 credits, including 36 credits in core major courses. Online courses last six weeks, and students can start the program during any term. The number of transfer credits determines a student’s academic plan. Students with fewer than 48 transfer credits will start with general education and elective courses, while students with more than 48 transfer credits will take core psychology, general education, electives, and concentration courses. The college also awards students credit for life experience. Financial aid is available for psychology online courses. The college is regionally accredited by the Southern Association of Colleges and Schools Commission on Colleges. Oregon Tech offers affordable online degree completion programs, and all students pay the same tuition rate, regardless of residency. Online courses are usually asynchronous and are delivered through the Blackboard platform. The bachelor of science in applied psychology consists of courses in communication, humanities, general education, and psychology. Students are also required to complete a three-credit capstone. Learners take 54 credits of electives and are required to complete 12 credits of an applied experience, which includes research and independent study projects or an externship. Externships are generally completed in a student’s own city and provide real-world experience. Oregon Tech operates on the quarter system, with three, 10-week terms offered in the fall, winter, and spring; summer quarter runs on an eight-week term. Once admitted to the online psychology degree, students receive a transfer evaluation and determine their academic plan with assistance from an online academic adviser. PAU, located in Palo Alto, California, was originally founded to foster scholarship in the field of psychology, which makes it uniquely qualified to offer a BS in psychology and social action and a BS in business psychology. Neither program has on-campus requirements, although, courses require students to attend one-hour, weekly, live video conference sessions. Curricula in the two online psychology degrees is slightly different. The business psychology program is comprised of 60% business and 40% psychology courses and does not require an internship. The psychology and social action program is 60% psychology and 40% social action courses and requires an internship. Both programs qualify graduates to pursue advanced degrees, take two years to complete, and guarantee that tuition will not increase over the course of a student's education. The average GPA of admitted students is 2.7, and students must have completed two years of college coursework, or 60 semester hours, in order to apply. CWU offers 10 online bachelor’s completion programs. The university grants online tuition waivers that allows out-of-state students to take advantage of in-state tuition prices, making it one of the most affordable online colleges for psychology. The 45-credit bachelor of arts in psychology admits students in the fall, winter, and spring quarters; priority application dates are February 1 for fall, November 1 for winter, and March 1 for spring. Students must first apply and be accepted to CWU before applying to the psychology major, which requires students to have completed the general psychology course with a C grade or higher. Transfer students can transfer up to 135 quarter credits, and students will receive an official transfer evaluation after being admitted to the university. Online students have access to the online resource center, which assists them with preparing for online learning and provides general and programmatic advising. CWU’s online programs are currently unavailable to residents of Alabama, Arkansas, Iowa, Kansas, Maryland, Minnesota, and Missouri. UHD offers 15 degree completion programs online through the Blackboard platform, including the bachelor of science in psychology. Online student services include advising, disability services, and library access. Students choose one course from each cluster, with clusters focusing on statistics, social/personality, clinical, cognitive/neuroscience, developmental, diversity, and career. The upper-level curriculum is available online, including courses that cover topics in human growth and development, clinical studies, and memory. This affordable psychology degree online prepares graduates for careers in counseling services, community relations, and human resources. Applicants are required to have a minimum GPA of 2.0 and can apply to the university in any of the six terms offered during the year. Residents of California, Connecticut, Florida, Kentucky, Massachusetts, New Jersey, Pennsylvania, Utah, and Wisconsin are not currently eligible for UHD’s online programs. The 120-credit bachelor of science in psychology is offered at Northeastern’s campus in Boston and entirely online. Students must complete credits in general foundation, psychology foundation, psychology major, and major elective courses. Students also choose 15 semester hours of electives from options that include techniques in individual and group counseling, human sexuality and love, and motivation. Admission requirements for the program include an online application, academic transcripts, and any transfer documentation; this is one of the online schools for psychology that does not require previously earned college credits. Applicants can apply for the fall, spring, or summer terms. Online students have access to career services, which includes an online resource center featuring information on networking, interviewing, and cover letters, and a database of full-time job opportunities. Park University was established in 1875 in Parkville, Missouri, and has 41 campus centers and an online campus that delivers more than 20 bachelor's programs. The bachelor of arts in psychology is a 122-credit program that consists of 42 major credits, including core curriculum and electives. Students must complete a field placement and a senior capstone, which includes a comprehensive senior examination that is worth 25% of the student’s grade in the capstone course. Prospective students should submit the online application and a high school diploma or equivalent, and have a minimum 2.0 GPA in any previously earned college coursework. After all documents are submitted, students will receive an admission decision within 48 hours. Regardless of residency, students pay the same rate, with special tuition rates for military personnel, veterans, and federal employees. Scholarships are available to first-time freshmen and transfer students. All online programs at UMUC feature asynchronous learning, allowing students to log in when it is convenient for them. Students in the online bachelor of science in psychology communicate with their classmates and faculty through online discussions and group projects. The university is replacing the need to buy textbooks with open educational resources, which do not carry an additional cost. Online courses are offered in eight-week sessions, which allows students to focus on fewer courses at a time. The online psychology degree is 120 credits, and students can transfer in up to 90 previously-earned credits. Out-of-state students pay more for tuition. Students complete major courses, general education, and elective requirements, with the ability to choose 43 credits of elective coursework that can also be applied towards a minor. Assignments include analyzing case studies, creating programs for specific needs, and preparing presentations. Faculty in the bachelor of science in psychology include nationally-renowned psychologists, sociologists, and anthropologists. Students in the 120-credit online psychology degree can take introduction to psychology their first term, one of the 39 courses required to complete the program. Online courses last seven and a half weeks, with most students enrolling in two or three classes per session. Students must have a major and cumulative GPA of 2.0 in order to graduate. First-time freshmen applicants must meet minimum scores on standardized tests and have a 3.0 GPA in competency courses. Arizona residents who have completed an associate degree with a 2.0 GPA or higher are assured admission. Students can transfer up to 90 credit hours, though the maximum number of transferrable community college credits is 64. Students can apply to begin the program any term, but applications must be submitted at least two weeks prior to the start of the session. OSU Ecampus offers over 1,000 courses online and more than 20 online undergraduate degrees. Students can choose from two online psychology degrees, the bachelor of arts or the bachelor of science in psychology. Both degrees require 180 quarter credits and have the same tuition. Curricula in the degrees is also similar, consisting of core courses, electives, 65 credits in the psychology major, and 15-24 credits in the BA or BS-specific requirements. Online students can add a minor to their program; OSU offers over 25 minors online. Psychology students may be interested in minors in education, public health, or sociology. Online learning at OSU is delivered through the Canvas platform, and courses are delivered asynchronously. Ecampus resources include success counseling, career services, disability access services, and continuous Canvas support. OSU operates on the quarter system, with four, 11-week terms per year. Regis University's bachelor of science in applied psychology covers topics in lifespan development, abnormal behavior, and positive psychology. The program prepares students for a variety of careers, including social work, medical consulting, and advocacy. The 120-credit degree consists of credits in core, foundational, upper division, and general elective requirements. A minor can be added without increasing overall time to degree completion, as students can use elective credits to earn the additional credential. Students must have a high school diploma, transferrable credits from a regionally-accredited institution, and evidence of work experience; students without one or more of these criteria must submit a letter of exception to the assistant dean. Online and classroom students at the Denver campus are charged the same tuition rate. Learners may be eligible for financial assistance, including federal aid, state aid, tuition remission, government assistance, and institutional scholarships, making this online psychology degree affordable. Must be an accredited public or private, not-for-profit college. Must offer a bachelor's degree program in psychology, 100% online. *Loan default rate represents an average of the last three reported years.